I hope that you all enjoyed your memorial day weekends! I know I did. I trekked Southward down the coast, out of my home state of Oregon to Bolinas, CA and the Regenerative Design Institute. I enjoyed a weekend of beauty, ocean views, fresh local foods, and wonderful people. If you have not heard of the Regenerative Design Institute (RDI - and I imagine you have not), you should know that it is a Permaculture demonstration farm seated within Point Reyes National Park. Permaculture is the study and practice of sustainable agriculture that focuses on creating closed-loop ecosystems that are balanced and allow people to provide for themselves in harmony with nature. If it sounds idyllic and fringe that is because it is! The RDI property is nestled into the side of a deeply forested hill where one can hear the ocean roaring at night. Chickens range the property which is dotted with gardens bearing fruit, vegetables and herbs. The staff are mostly volunteers who give their time and energy in exchange for knowledge and experience. It is within this setting that our story takes place. I was gifted an amazing birthday wine basket by my dear friend Jason upon my arrival, complete with four different wines and a vase full of fresh wild roses. Talk about a way to make a girl happy! Visitors on the property must give back in some way - either through work, food, or money. I opted to go with my favorite of the three options, food, and offered to cook the crew dinner on Saturday night. Of course for me food also includes wine, so I decided to take the opportunity to crack one of my new bottles and talk about wine with a group of interesting people. 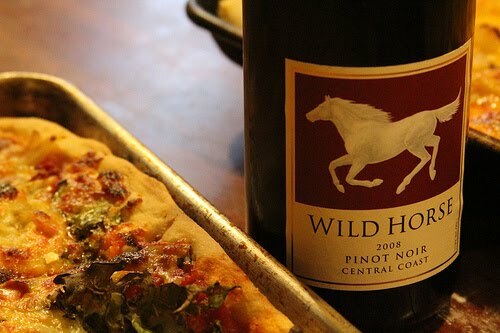 Our wine for the evening was a 2008 Wild Horse Pinot Noir made from grapes that spanned the Central Coast region. I paired it up with three different homemade pizzas - 1) barbecue and red sauce pizza with turkey, greens, fresh sage, caramelized onion and cheddar cheese, 2) cheese pizza with mozzarella, red sauce, garlic, fresh thyme, and greens, and 3) a white pizza with garlic, homemade goat feta, fresh oregano, asparagus, and caramelized onion. All of the veggies besides the onion were harvested on the property, and the feta was made from milk from the RDI goats. - are there any flavors you notice? - are there any words you would use to describe this wine? - are there any foods you think would taste good with the wine? - is there anything else you notice? The wine came from the bottle with a beautiful almost brownish maroon. The nose took a long time to open up, and most people felt they did not smell a whole lot. This might also have to do with the fact that we were standing right over the top of hot, delicious-smelling pizza. I noted some tart cherry, dark fruit, and vanilla. Jacob stated that he really enjoyed the way the wine smelled, and that it tasted very differently when he took a sip. Both Todd and Stacia noted berry flavors initially, and Sally chimed in saying that she would describe the flavor as juicy. I would have to agree that there was a dark berry flavor that included a smooth texture. Christine noticed the wine was peppery, and both she and Erin stated that they found it warming in their chests the more they drank. This was accented with some hints of clove at the center of the flavor. Kaylin found there to be a sour, almost citrusy finish that she said she did not really enjoy, and both Jason and Jacob said they found the finish to be fairly weak. This was not a Pinot Noir that packed a large punch, and initially I found it to be more like a Cabernet Sauvignon because of how strongly fruity it was. When we dove into the pizza I found it really enhanced the flavor of the wine. The garlic of the white pizza in particular gave the wine a sharper, more acidic sensibility and texture and highlighted its pepperiness. I also really enjoyed how the saltiness of the feta brought out the berry flavors. 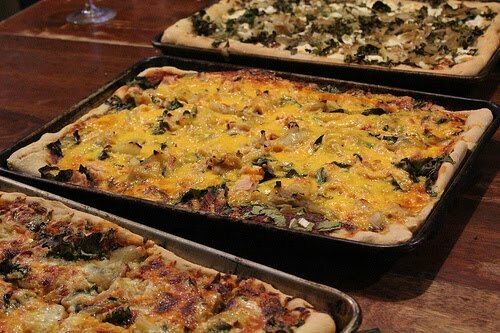 I have to say that the pizza and wine party was a success - if I do say so myself! I want to send out a special thank you to all of the staff at RDI for being such wonderfully hospitable, and to Jason for giving me so many awesome wines to try!!! I send you all love and thoughts of warm sunshine. This makes me hungry...and thirsty...even though I just ate. Nom nom nom.